Brian Matthew celebrates the golden age of British dance bands. In this episode, Brian looks at Roy Fox, the 'Whispering Cornettist'. Brian Matthew celebrates the golden age of British dance bands, when some of the biggest and most glamorous stars on the pop scene were bandleaders. 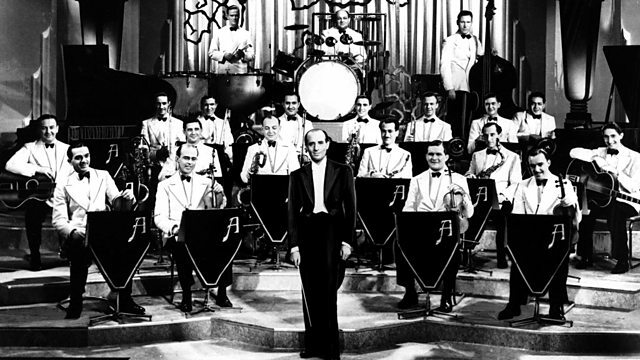 This week's bandleader in the spotlight is the Californian emigre Roy Fox who came to Britain in 1930 as "The Whispering Cornettist" and put together one of the sharpest bands on the scene. With a dapper manner and a past that included affairs with the likes of Jean Harlow, Fox brought to the role of bandleader a sophisticated elegance unmatched by any others. Writer Tony Staveacre has scoured the BBC's sound archive and interviewed many musicians and friends to assemble this vivid portrait of an era Robert Graves called "The Long Garden Party". The series includes contributions from Ambrose and Roy Fox; band members; experts like Russell Davies, as well as Brian Matthew himself, who personally knew many of the figures in this remarkable story. We also hear the music created by these men and the "bands that mattered". Music to which a whole generation danced in the great houses and palaces, prestigious hotels, swanky night-clubs, ballrooms and - by listening live nightly on the BBC - in private homes. Ray Noble: The HMV Sessions 1930-34 Volume 4. Chronological Bing Crosby Volume 5. The Decca Years Volume 2 “Over On The Sunny Side”. ASV Living Era (CD AJA 5352). The Decca Years Volume 3 “Lullaby Of The Leaves”. Writing A Letter to You:.